BOB DYLAN: On Bob Dylan steps 1984 Nantes France. And the unbelievable happened. One of my wild dreams came true: Dylan will play in Nantes (my home town) June 30, 1984. 28 concerts are announced in Europe with Carlos Santana and Joan Baez .... The King and Queen together again? At 10 a.m. two of my sisters and I are at the gate of the stadium. A few early risers are already there, there are even those who have slept there. Doors should open at noon and the first group should be on at 4:00 p.m. The queue lengthens. We become nervous. The doors will finally opened at 2:15 p.m.. A sprint to the front of the stage and we take a well deserved snack. The afternoon will be long for Bob will be on at 9:00 p.m. I wonder if I'll see Jim or Stan or Meyers. The local group trying to defend themselves against an unexpected crowd. The Queen appears. There are rumors that it will be her last concert on that tour. "I had problems with my manager," said she "because it's a woman." No problem with moody Bobby? Her show is the same as 78,79,80,81,82,83 ... she has more wrinkles and white hair and her smile seems stuck. Her French has not improved. But is it not on purpose? But the audience is clearly there for Dylan. It is just polite. She asks the front row to seat. Is she mad? We are pressed against the fence! Santana shows up: gaunt but in good shape. Macrobiotics had worked out. His band is rather eclectic: white, black, Chicano ... percussion in all directions. He escapes in a song that never ends by turning to the image of his Guru and ignoring the public. I see Stanley and beckoned him to approach. A hug, a kiss. "I wondered when I would see you? " "No, he works for Neil Diamond"
Meyers does not seem to be around, it's a Tour organized by Bill Graham. "I could put you on the stage but you seem to have a good seat here. You go to Paris and Grenoble? " "Will he Tour in America? " "Tell him hello for me!" I chew some cherries that I swallow raw because sooner than I expected here He walks on stage. White shirt, long black shirt over it, no hat, no glasses. At full speed he starts "Highway61" I have trouble recognizing. Mick Taylor on the left, swollen and old. Lost behind the material three "punks" with no personality. The worst group I've ever seen. He, alone with an acoustic guitar would fit the bill. No need to sign him he sees nothing, it's almost if it does not bump into the microphone. "Highwai61," "Jokerman," "All Along the Watchtower," "Just Like A Woman," "Maggie's Farm", "I and I", "license to kill", "A hard rain's a gonna fall" " Girl of The North Country "," It's Alright Ma, "" Simple Twist of Fate, "" The Ballad of Hollis Brown "," Ballad of a Thin Man, "" Masters of War "," Every grain of sand "," Like a Rolling Stone. " He presents his musicians before going on. "The Lonesome Death of Hattie Carol," "The Time's They Are a-Changing", "It Takes a Lot to Laugh, It Takes a Train to Cry," "Leopard skin pill box hat", a still with Santana "Blowing in the wind "" Tombstone Blues ". "This is the first time we made the song"
"that is not true, we do it all the time ". Mr D is in a bad mood. He seems bored. We have almost enjoy it from the first songs but it soon became déjà vu (French in the text). The fact that he does not wear glasses suggests to me that he did not want to see us. I am both pleased and disappointed. If the whole Tour is like this I do not regret not being part of it. The usual rumors circulate: he escapes just after the show, he travels by private jet, he stays in few secret hotels. 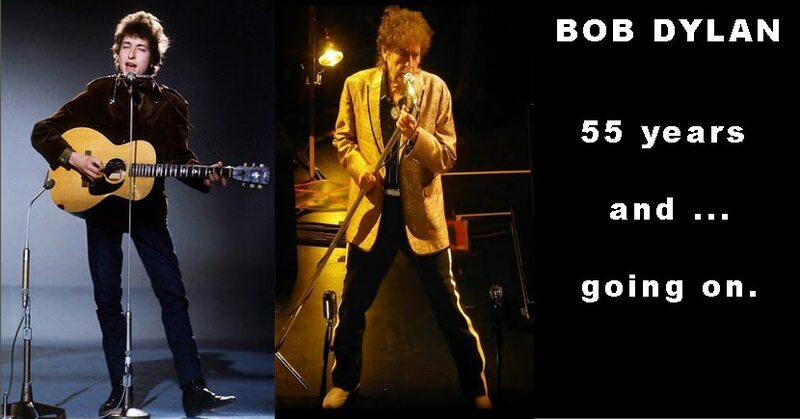 Everything is false according to my friend Claude Angel Boni who intimately encounters him during this tour (story told in her book 'Stuck Inside of Mobile: a Rapsody for Bob Dylan). It Can pierce-through dust no matter how thick. And bid farewell and do not give a damn "